K.M. 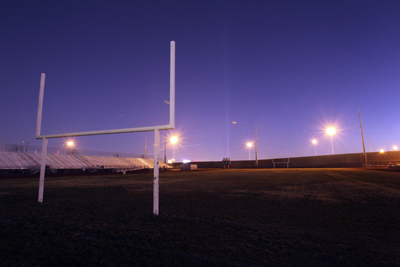 CANNON/LAS VEGAS REVIEW-JOURNAL The Western High School football field is shown Thursday, Oct. 27, 2011. All football teams at the school have cancelled the season and forfeited remaining games because of a player's hazing more than two weeks ago in the team's locker room before an evening practice. Western High School’s football program set a record this season, but not the kind players wanted. It’s the first sports program in the Clark County School District to cut its season short and forfeit remaining games for all teams, freshmen to varsity, according to district officials. That was the consequence of a player’s hazing more than two weeks ago in the team’s locker room before an evening practice. In the wake of the incident, seven players weren’t allowed back in school, according to several varsity players wishing to remain anonymous for fear of retribution from teammates. Since then, two players have returned to school, according to sources, but five others remain suspended pending possible expulsion from the school. The school principal investigates and makes a recommendation to Schleifer. He then considers each student’s involvement and history and meets with the student and parent. Punishment varies based on a student’s history. Plus, there is no set rule for bullying. “Bullying is really in the limelight right now,” said Schleifer, remarking how the state now requires districts to annually report expulsions resulting from bullying or cyberbullying, meaning harassing through technology such as texting, Facebook and Twitter. Gov. Brian Sandoval has made it his mission to put a stop to school bullying. Of the 4,890 Clark County students expelled last school year, 108 — 2 percent — were for “bullying, cyberbullying, harassment or intimidation,” according to the district. Six expulsions for bullying occurred in 2009-10 out of 4,522 expulsions. The district didn’t categorize expulsions by bullying in prior years. Drug possession is the only offense resulting in at least 1,000 expulsions in any year since 2007-08. However, those cases are clear-cut, Schleifer said. Bullyings occasionally result in expulsion, depending on circumstance and the bully’s history. If parents don’t agree with the district’s punishment, they can appeal to a panel consisting of a teacher, administrator and support staff member from another district school, Schleifer said. If they’re still not satisfied, parents can appeal to one other board of non-district personnel. Angela Panzeri, mother of a junior-year player and team mom who helped at practices, argues that Western and district administrators should have stopped at suspensions and expulsions. But every player suffered the consequences when the season was canceled with a 0-6 record, even those not involved in the hazing, like her son. The announcement crushed the team, said a player, describing the day when the assistant principal pulled players from their sixth-period classes to tell them. Their chance to come out ahead in at least one game was taken away. “There was a lot of hurt and tears in the school,” a player said. Although Western Principal Neddy Alvarez is refusing to comment on the hazing, several varsity players have independently confirmed what happened. Some sources were participants and others witnesses. A senior-year player, described as one of the smaller guys who others would poke fun of, walked in with masking tape. He asked who wanted to be taped to a chair and volunteered to be first. About seven players jumped at the opportunity and tied him down with the tape and their belts. At this point, he grew noticeably uncomfortable and asked to be let go. But his teammates ignored his pleas as they taunted him and wheeled him out of the locker room into the school quad, which was empty this late after school. “They were laughing at him and calling him names,” a player said. They eventually let him go, sources said. But he discovered someone stole his iPod, which was returned after he reported the incident to school administration. Most of those involved in the hazing were seniors, a player said. Their suspensions made them ineligible and left about 14 players on the varsity squad. Western started the season short on numbers. Several junior varsity players already had been moved up to fill vacant varsity spots. Moving more up wouldn’t be safe, one player said. The school of 2,300 students has struggled for years to recruit enough players, sources said.